The Pride of the Yankees is a 1942 American film produced by Samuel Goldwyn, directed by Sam Wood, and starring Gary Cooper, Teresa Wright, and Walter Brennan. It is a tribute to the legendary New York Yankees first baseman Lou Gehrig, who died only one year before its release, at age 37, from amyotrophic lateral sclerosis, which later became known to the lay public as "Lou Gehrig's disease". Rudolph Maté A. S. C.
Though subtitled "The Life of Lou Gehrig", the film is less a sports biography than an homage to a heroic and widely loved sports figure whose tragic and premature death touched the entire nation. It emphasizes Gehrig's relationship with his parents (particularly his strong-willed mother), his friendships with players and journalists, and his storybook romance with the woman who became his "companion for life," Eleanor. Details of his baseball career—which were still fresh in most fans' minds in 1942—are limited to montages of ballparks, pennants, and Cooper swinging bats and running bases, though Gehrig's best-known major league record—2,130 consecutive games played—is prominently cited. Yankee teammates Babe Ruth, Bob Meusel, Mark Koenig, and Bill Dickey play themselves, as does sportscaster Bill Stern. The film was adapted by Herman J. Mankiewicz, Jo Swerling, and an uncredited Casey Robinson from a story by Paul Gallico, and received 11 Oscar nominations. Its climax is a re-enactment of Gehrig's poignant 1939 farewell speech at Yankee Stadium. The film's iconic closing line—"Today, I consider myself the luckiest man on the face of the Earth"—was voted 38th on the American Film Institute's list of 100 greatest movie quotes. Lou Gehrig (Cooper) is a young Columbia University student whose old-fashioned mother (Elsa Janssen) wants him to study hard and become an engineer, but the young man has a gift for baseball. A sportswriter (Brennan) befriends Gehrig and persuades a scout to come see him play. When his mother gets sick, Gehrig signs with the team he has always revered, the New York Yankees to pay for the hospital bills. With the help of his father (Ludwig Stössel), he endeavors to keep his career change a secret from his mother. Gehrig works his way up through the minor leagues and joins the Yankees. His hero, Babe Ruth, is at first condescending and dismissive of the rookie, but his strong, consistent play wins over Ruth and the rest of the team. Gehrig is soon joining teammates in playing pranks on Ruth on the team train. During a game at Comiskey Park, Gehrig trips over a stack of bats and is teased by a spectator, Eleanor (Wright), who laughingly calls him "tanglefoot". Later, they are properly introduced, leading to a relationship, and then an engagement. Gehrig's mother, who still hasn't accepted the fact that her son will not be an engineer, does not take this news well; but Gehrig finally stands up to her and marries Eleanor. The Yankees become the most dominant team in baseball, and Gehrig becomes a fan favorite. His father and fully converted mother attend games and cheer for him. In a re-creation of a famous (and possibly apocryphal) story, Gehrig visits a crippled boy named Billy (Gene Collins) in a hospital. He promises to hit two home runs in a single World Series game in the boy's honor—then fulfills his promise. Gehrig is now the "Iron Horse", a national hero at the peak of his career with multitudes of fans, many loyal friends, and an adoring wife. Then he begins to notice, with growing alarm, that his strength is slowly ebbing away. Though he continues to play, and extends his consecutive-game streak to a seemingly insurmountable record, his physical condition continues its inexorable decline. One day, in Detroit, he tells Yankees manager Joe McCarthy (Harry Harvey) that he has become a detriment to the team and benches himself. After an examination, a doctor gives him the awful news: Gehrig has a rare, incurable disease, and only a short time to live. A year later, at Lou Gehrig Day at Yankee Stadium, an older Billy (David Holt) finds Gehrig and shows him that he has made a full recovery, inspired by his hero's example and the two-homer fulfilled promise. Then, as Eleanor weeps softly in the stands, Gehrig addresses the fans: "People all say that I've had a bad break. But today ... today, I consider myself the luckiest man on the face of the Earth." Samuel Goldwyn displayed little interest in Sam Wood's initial proposal to make a movie tribute to Gehrig, as he had no knowledge or interest in baseball. In addition, conventional Hollywood wisdom dictated that sports pictures were box-office poison, as women, who made up more than half the audience and made most movie-going decisions, didn't like them. After Wood screened newsreel footage of Gehrig's famous "luckiest man" speech, however, Goldwyn—with tears in his eyes—agreed to produce the picture. In a 1941 press campaign publicizing plans for the film, RKO Pictures announced a major talent hunt for Gehrig's portrayer; but Goldwyn and Wood reportedly never considered casting anyone but Cooper in the title role. Although he was ideally suited to the part due to his physical resemblance to Gehrig and the quiet strength and masculine appeal that he projected, Cooper was reluctant to accept it because he, like Goldwyn, had no interest in baseball. By one account, he had never watched a game prior to taking the role. Another problem was Cooper's age (41), particularly in scenes involving Gehrig as a young man. Cinematographer Rudolph Maté lighted Cooper from below during those early scenes to conceal lines and wrinkles, then gradually reduced and finally eliminated the lighting effect as the story progressed. Another important (and problematic) casting decision was Babe Ruth, as himself. Ruth's health had been declining steadily since his retirement in 1935, and by 1942 he weighed nearly 270 pounds. He was put on a strict diet to achieve a presentable weight before filming began. This rapid weight loss, on the heels of a heart attack followed by a car accident, combined with the tough shooting schedule and Ruth's propensity to keep late hours, weakened him significantly. By the time filming wrapped he had developed pneumonia severe enough to require a period of hospitalization. Multiple published sources have asserted that Cooper, who was right-handed, could not master a convincing left-handed swing. To remedy the problem, the story went, he was filmed wearing a mirror-image uniform and swinging from the right side of the plate, then running to third base instead of first; technicians then purportedly flopped the print of the film. Tom Shieber, a curator at the National Baseball Hall of Fame, has shown, however, that Cooper did indeed learn to bat left-handed, and never wore a backwards Yankees uniform nor ran to third base after swinging. Film footage was, in fact, flopped only once, during a brief sequence portraying Gehrig's minor league days at Hartford, in order to make Cooper appear to be throwing left-handed — a far more difficult task for a right-hander to master. ("[Cooper] threw the ball like an old woman tossing a hot biscuit," said Lefty O'Doul, who tried unsuccessfully to teach him a convincing left-handed throw.) 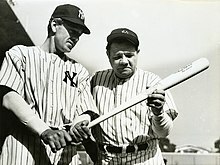 Scenes requiring Cooper to throw a ball as a Yankee were filmed using his stand-in, the left-handed Babe Herman. Scenes purporting to depict Yankee Stadium, Comiskey Park, and other ballparks were all filmed at Wrigley Field in Los Angeles, home of the Los Angeles Angels of the old Pacific Coast League, and a popular venue for baseball movies of the era, as well as the Home Run Derby television series. to the youth of America. This is the story of Lou Gehrig. Gehrig died on June 2, 1941. The film premiered on July 14, 1942 in New York City at the Astor Theatre, and was shown for one night only at "forty neighborhood theatres." Preceding the film was the premiere of an animated short called "How to Play Baseball," produced by Walt Disney Animation Studios at Goldwyn's request. Variety magazine called the film a "stirring epitaph" and a "sentimental, romantic saga ... well worth seeing." Time magazine said the film was a "grade-A love story" done with "taste and distinction" though it was "somewhat overlong, repetitive, undramatic. Baseball fans who hope to see much baseball played in Pride of the Yankees will be disappointed. Babe Ruth is there, playing himself with fidelity and considerable humor; so are Yankees Bill Dickey, Bob Meusel, Mark Koenig. But baseball is only incidental. The hero does not hit a home run and win the girl. He is just a hardworking, unassuming, highly talented professional. The picture tells the model story of his model life in the special world of professional ballplayers." Bosley Crowther of The New York Times called it a "tender, meticulous and explicitly narrative film" that "inclines to monotony" because of its length and devotion to "genial details." The Pride of the Yankees was the 7th-highest grossing film of 1942, with $8.08 million in box office receipts. Despite its wide popularity, RKO took a loss of $213,000 on the film due to the small distribution fee that Samuel Goldwyn had negotiated with the studio. All of Goldwyn's pictures produced a loss for RKO no matter how much money they took in; but the studio considered the arrangement acceptable, because its association with Goldwyn lent prestige to RKO, and enhanced sales of its own movies. The American Film Institute ranked The Pride of the Yankees 22nd on its list of the 100 most inspiring films in American cinema. In AFI's 2008 "Ten Top Tens"—the top ten films in ten "classic" American film genres—The Pride of the Yankees was ranked third in the sports category. Gehrig was named the 25th greatest hero in American cinema by the AFI in 2003. As the film opens, Gehrig is depicted belting a home run through a window of the Columbia University athletic building. That building is actually located on the north end of campus, well away from the baseball field; his farthest hits most likely smashed through the windows of a nearby building housing the School of Journalism. It is shown that Lou Gehrig hits two home runs in a World Series game where Babe Ruth also homers. Such a situation never occurred. It is shown that Gehrig meets Eleanor Twitchell early in his career and marries her shortly after his first World Series. Actually the two met in 1931 well after Gehrig was an established star. They were married in 1933. In one of the film's more memorable scenes, a physician matter-of-factly informs Gehrig of his tragic diagnosis, dismal prognosis, and brief life expectancy. In fact, Mayo Clinic doctors painted an unrealistically optimistic picture of Gehrig's condition and prospects, reportedly at his wife's request. Among other things he was given "a 50–50 chance of keeping me as I am" for the foreseeable future, and was told that he "...may need a cane in 10 or 15 years." Deliberate concealment of bad news from patients, particularly when cancer or an incurable degenerative disease was involved, was a relatively common practice at the time. There is no known intact film of Gehrig's actual speech at Yankee Stadium on July 4, 1939; a small portion of the newsreel footage, incorporating his first and last remarks, is all that survives. For the movie, the speech was not reproduced verbatim; the script condensed and reorganized Gehrig's actual spontaneous and unprepared remarks, and moved the iconic "luckiest man" line from the beginning to the end for heightened dramatic effect. Gehrig's message remained essentially unchanged. "Fans, for the past two weeks you have been reading about a bad break. Yet today I consider myself the luckiest man on the face of the Earth. I have been in ballparks for seventeen years and have never received anything but kindness and encouragement from you fans. "When the New York Giants, a team you would give your right arm to beat, and vice versa, sends you a gift - that's something. When everybody down to the groundskeepers and those boys in white coats remember you with trophies — that's something. When you have a wonderful mother-in-law who takes sides with you in squabbles with her own daughter — that's something. When you have a father and a mother who work all their lives so you can have an education and build your body — it's a blessing. When you have a wife who has been a tower of strength and shown more courage than you dreamed existed - that's the finest I know. "I have been walking onto ball fields for sixteen years, and I've never received anything but kindness and encouragement from you fans. I have had the great honor to have played with these great veteran ballplayers on my left - Murderers' Row, our championship team of 1927. I have had the further honor of living with and playing with these men on my right - the Bronx Bombers, the Yankees of today. "I have been given fame and undeserved praise by the boys up there behind the wire in the press box, my friends, the sportswriters. I have worked under the two greatest managers of all time, Miller Huggins and Joe McCarthy. "I have a mother and father who fought to give me health and a solid background in my youth. I have a wife, a companion for life, who has shown me more courage than I ever knew. "People all say that I've had a bad break. But today ... today, I consider myself the luckiest man on the face of the Earth." The Pride of the Yankees was adapted as an hour-long radio play on the October 4, 1943 broadcast of Lux Radio Theater with Gary Cooper and Virginia Bruce and a September 30, 1949 broadcast of Screen Director's Playhouse starring Gary Cooper and Lurene Tuttle. ^ "The Pride of the Yankees". American Film Institute. Retrieved January 6, 2015. ^ a b c d The Pride of the Yankees. TCM.com, retrieved June 2, 2017. ^ a b "The Pride of the Yankees, Remembered". Columbia Magazine, April/May, 1989, p.18. ^ Povich, Shirley (July 13, 1942). "Gehrig Tribute to Open Saturday." Washington Post, p. C-1. ^ Sandomir, Richard (8 February 2013). "Reversing Course on Reports About a Classic". The New York Times. Retrieved 10 February 2013. ^ a b Crowther, Bosley. "Pride of the Yankees". The New York Times. Retrieved 2009-06-19. ^ "The Pride of the Yankees". Variety. 1942. Retrieved 2009-06-19. ^ "The New Pictures, Aug. 3, 1942". Time. August 3, 1942. Retrieved 2009-06-19. ^ 1942 Top Grossing Movies. ultimatemovierankings.com, retrieved June 2, 2017. ^ "The 15th Academy Awards (1943) Nominees and Winners". oscars.org. Retrieved 2011-08-14. ^ "The Pride of the Yankees". The New York Times. Retrieved 2008-12-14. ^ American Film Institute (2008-06-17). "AFI Crowns Top 10 Films in 10 Classic Genres". ComingSoon.net. Retrieved 2008-06-18. ^ "Top 10 Sports". American Film Institute. Retrieved 2008-06-18. ^ Robinson, Ray (28 May 2011). "For the Columbia Class of '41 It Is Always the Day After". The New York Times. Retrieved 10 February 2013. ^ Krieger, T. Eleanor Gehrig. Society for American Baseball Research. Retrieved September 29, 2014. ^ Letter from Eleanor Gehrig to Dr. Paul O’Leary of the Mayo Clinic, April 9, 1940. In a postscript, Eleanor requested that O’Leary address his response to her with a pseudonym (Mrs. E. G. Barrow). O’Leary complied. ^ Kaden, S. (2002). "More About His ALS Battle". Retrieved 2008-04-16. Wikimedia Commons has media related to The Pride of the Yankees.